Gregory Owen "Gregg" Zaun (/ˈzɔːn/; born April 14, 1971) is an American-Canadian baseball analyst, public speaker and a retired professional baseball catcher. He played for nine different teams over sixteen seasons in Major League Baseball from 1995 until 2010, winning a World Series Championship in 1997. Since 2006, he has served as an on-air personality with Sportsnet in Canada. Zaun, the nephew of former MLB catcher Rick Dempsey, was a high school teammate of Mark Loretta. Zaun and Loretta attended Saint Francis High School in La Cañada, California and graduated in 1989. 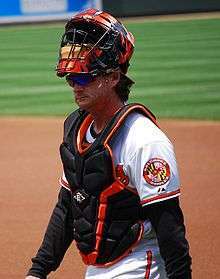 Drafted by the Baltimore Orioles in the 17th round of the 1989 Major League Baseball draft, Zaun reached the majors with the Orioles in June 1995. Used primarily as a back-up early in his career, he was traded to the Florida Marlins in 1996. After winning a World Series with the Marlins in 1997, he moved to the Texas Rangers prior to the 1999 season. He has also played with the Kansas City Royals, Houston Astros, and Colorado Rockies. He signed as a free agent with the Blue Jays prior to the 2004 season. In 2004, the Blue Jays were the first team to make Zaun, at 33, a starting catcher. Valuable in the line-up as a switch-hitter, he set a career high in 2005 with 133 games. Prior to the 2006 season, the Blue Jays signed Bengie Molina as the everyday catcher, making Zaun the backup. Zaun started 2006 on the disabled list, with Jason Phillips serving as Molina's backup during the first week of the year. Zaun hit a game-winning two-run homer off the Tampa Bay Devil Rays' Jason Childers in his return on April 8. Molina's struggles against right-handed pitchers caused John Gibbons to platoon the two, with Molina generally starting against left-handed pitchers and Zaun playing against righties. On September 13, 2006, he hit home runs from both sides of the plate in the same game. He was only the 4th Blue Jay in history to do this. Because the Toronto Blue Jays actively pursued Rod Barajas of the Texas Rangers as the club's new starting catcher during the 2006 offseason, it was assumed that Zaun would be exploring free agency as signing Barajas would mean Zaun would be maintained as a backup. Meanwhile, negotiations between Zaun and the club deteriorated, as Zaun claimed that the Jays offered "slightly better than back-up money for playing every day". Negotiations with Barajas went as far as an offer conditional on a routine physical, but eventually fell apart for undisclosed reasons. After turning down a reported $6.5 million two-year offer from the Blue Jays a week earlier, Zaun officially accepted a two-year, $7.25 million contract offer to return to the Toronto Blue Jays as their starting catcher on November 28, 2006. The new contract deal also included a third-year option, guaranteed based on appearances. The signing came after Zaun was rumored to have been courted by the Boston Red Sox and New York Yankees, both in backup roles. Arguably his most famous play with the Jays was hitting a game-winning grand slam in the bottom of the 13th inning off of Tampa Bay Rays closer Troy Percival, on September 6, 2008 with two outs in the inning, wiping out the Rays, 7–4. Zaun hit only the second game-winning grand slam in Jays history but it was the first that occurred in extra innings, and even more spectacular was that his team was losing at the time, due to an RBI single by Dioner Navarro to put the Rays up, 4–3, before the slam at the top of the 13th. Zaun was claimed off waivers by the Tampa Bay Rays GM Andrew Friedman in exchange for Rhyne Hughes on August 7, 2009. On August 16, Zaun hit a pinch hit grand slam home run against his old team the Blue Jays in the 8th inning off Brandon League on a 3–2 fastball. On November 12, 2009, Zaun was granted Free Agency. On December 4, 2009, Zaun signed a one-year contract with the Milwaukee Brewers for $1.9 million. After suffering a severe injury, Zaun's 2010 season—and, as it turned out, his MLB career, ended on May 20. After the season, Milwaukee declined his contract option, and he became a free agent on November 2. In January, Zaun signed a minor league deal with the San Diego Padres, with an invitation to spring training. However, noting that he still had not recovered from his previous injury enough to play regularly, he chose to retire on March 7, 2011. In 2009, Zaun was included in the Mitchell Report following a 20-month investigation into the use of performance-enhancing drugs by former Senator George Mitchell. In the report, Kirk Radomski claimed he sold Deca-Durabolin and Winstrol to Zaun in 2001, after a referral from Jason Grimsley. Radomski produced a cheque from Zaun for $500. Mitchell also explained that former Montreal Expos bullpen catcher Luis Perez claimed to have supplied Zaun with steroids in 2002. Zaun declined to be interviewed for the report. Zaun (right) with fellow announcer Jamie Campbell in 2011. Zaun started his broadcasting career after the Blue Jays closed out their 2006 season. Throughout the playoffs, Zaun would offer his thoughts on how the teams and players were doing, and how he thought they could improve. He worked alongside Jamie Campbell on Rogers Sportsnet. He has continued to work on Sportsnet's post-season broadcast through 2013. After his retirement, on March 14, 2011 Zaun signed a two-year contract with Rogers Sportsnet to become their studio MLB analyst. He also serves as a part-time analyst on Sportsnet Radio Fan 590 and the Blue Jays Radio Network. As part of his duties he blogs on his website 'zauntourage.com'. On May 10–11, 2011 Zaun filled in as the color commentator on the NESN broadcast of a Red Sox series against the Blue Jays when the normal broadcaster, Jerry Remy was ill. He now does the Sportsnet pre-game show for the Toronto Blue Jays along with Jamie Campbell. ↑ "Gregg Zaun Stats". Baseball Almanac. Retrieved December 3, 2012. ↑ "zauntourage.com". Archived from the original on 2012-04-23. Retrieved 2012-06-27. ↑ Cole, Mike. "Gregg Zaun Filling In for Jerry Remy As Red Sox Open Series in Toronto Against Blue Jays". Retrieved 2012-06-27. Wikimedia Commons has media related to Gregg Zaun.